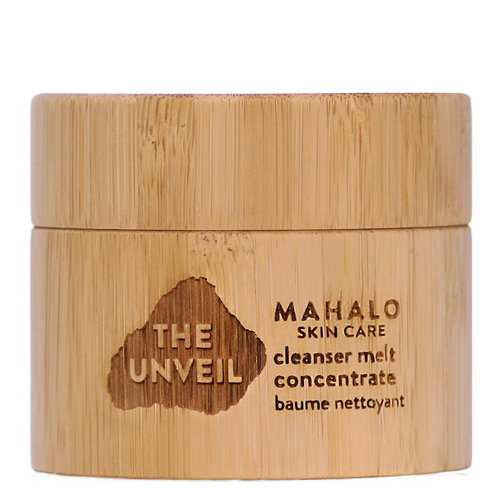 The Unveil Cleanser Melt Concentrate by Mahalo Skincare is a creamy oil cleansing balm that melts on contact. Infused with organic oils for a nourishing feel, it cleanses away makeup and impurities gently, while making skin feel fortified, protected, and replenished. Matcha green tea, alfalfa, arnica, comfrey, gotu kola, avocado, and cupuacu are only some of the super nutrients that will wash over your skin with each application. 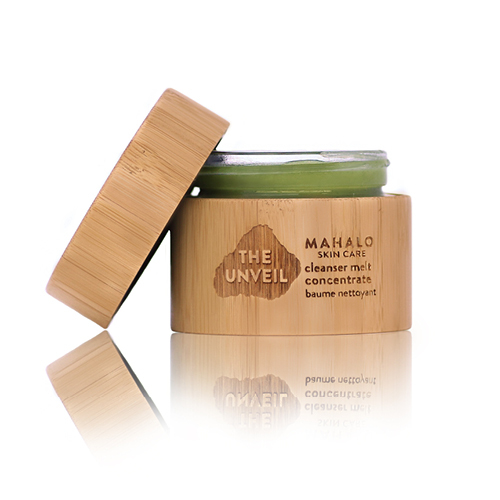 As is the signature of Mahalo skincare, this oil balm cleanser has a complex aroma of lemon, ginger, frangonia, pink peppercorn and cacao. 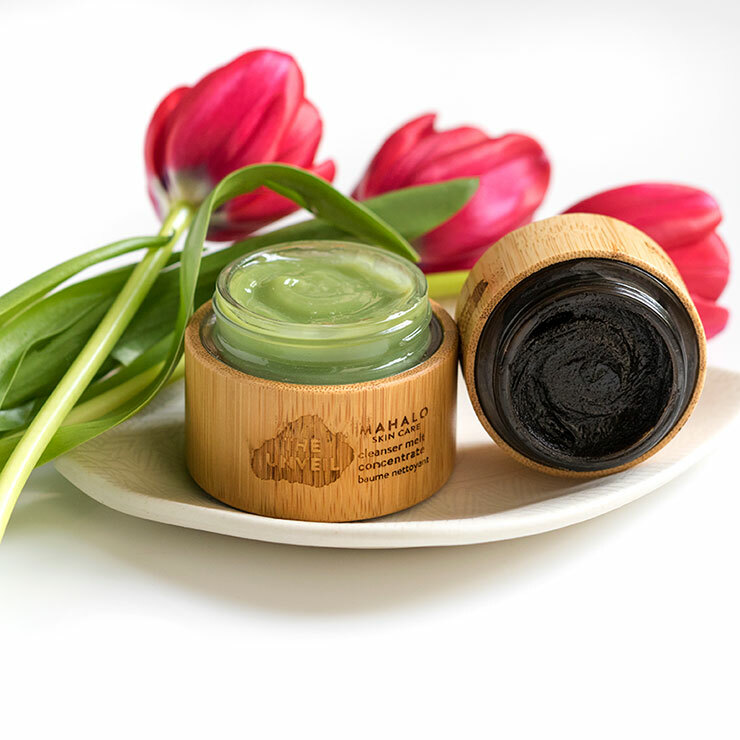 Place a half pea to pea size of the Unveil cleansing balm into fingertips and melt onto dry skin. Cleanses away makeup as you massage. Add warm water to your hands and continue to massage as cleanser emulsifies. Rinse completely with warm water. Repeat with a second cleanse if desired. Press a clean towel to skin to gently dry, leaving skin damp. Follow with toner, serum and moisturizer. Every day, I thank goodness for Danielle’s Limited Edition Box which led me to discovering this product. I absolutely love it. A little goes a long way. It cleanses the skin really well and the best part is that I don’t need to use a towel to take it off. The smell is almost like hemp and pine, and it just melts when it comes in contact with the skin. When I saw the bottom of the jar, I knew that this would certainly be a repurchase. Oh veil cleanser, where have you been all of my life? After two years of a Beauty Heroes subscription, I have found many brands I like, but only Mahalo products have continued to impress and surprise me consistently over time. It is an amazing brand and The Unveil is a great example of why. I have been curious about it for a long time, but it sounded a little odd to me. I don't like how most cleansing balms leave my face greasy and require a lot of tugging and scrubbing to remove. And I thought the scent profile sounded funny. But I took the plunge with the Level Up promotion, and I'm so glad I did. This is another product I will continue to repurchase from Mahalo. First, it glides on the skin easily. Second, it emulsifies with the addition of water, making it easy to remove. Third, the scent is heavenly. And finally, it removes all dirt and makeup from my face every time, leaving behind a clean, fresh, dewy skin. Luxury products are rarely workhorse products, but this one is. This is my go-to cleanser before bed. As with all Mahalo products, I appreciate this more and more with time. Just a delight. I was surprised that this balm rinses well even without using a washcloth. Great when you are in a hurry. I love it as a second cleanse or orning cleanser. I massage it through my skin and leave it on for around 5 minutes to let my skin absorb the oils, then rinse off. Skin feels refreshed, clean and not tight. It doesn't clog my pores nor cause breakouts- but of course I regularly use acid toners, masks and exfoliators.